Who invented macaroni & cheese? No one knows for sure, although the food historians generally credit the ancient Greeks and Romans for coming up with the idea of combining these two foods. The origin of pasta noodles macaroni is a matter of culinary controversy (Ancient Rome? Etruscans? China? Korea?). According to the Oxford Companion to Food, Alan Davidson, (Oxford University Press:Oxford) 1999 (page 159). Cheese is one of the oldest of made foods, dating back to the prehistoric beginnings of herding. As with all fermented products, it seems likely that the discovery of cheese was accidental. We do know that medieval macaroni dishes (lasagnes & raviolis) were made with cheese and sweetened with nuts and spices (The Medieval Cookbook, Maggie Black, Lasagne with cheese, pages 90-91). These would have tasted quite different from the mac and cheese we eat today. Colonial American cookbooks contained recipes for macaroni and cheese in the English tradition. Despite the many varieties, the most common name for pasta in later Medieval Italy seems to have been macaroni, although this now means the round as contrasted with the flat kind. The fourteenth century English Forme of Cury gives a recipes for macrows (an anglicized plural) that unquestionably produces a flat result, the recipes even recommends serving it strewn with morsels of butter, and with grated cheese on the side. In its native land it does not seem to have been regarded as a very high class food, in the sixteenth century. Cheese is the earliest condiment for pasta of which we have documentation. Even before the earliest recipes were written, cheese with pasta was the delight of the bon vivants of the Middle Ages...Present in all the medieval collections of recipes that feature pasta, grated cheese was often mixed with spices... These tortelli must be yellow and strongly spiced, serve them in bowls with plenty of pepper and grated cheese...Although it was abandoned by the elite beginning in the seventeenth century, the mixture of cheese and spices continued in popular use. Pasta was served with a carpet of well aged grated cheese in taverns frequented by Pere Labat in the turn of the eighteenth century. Pasta: The Story of a Universal Food, Silvano Serventi & Francoise Sabban (Columbia University Press:New York) 2000 (p. 258-9). Cook pasta according to package directions. Melt cheese in a microwave safe bowl. In skillet add ground beef, breaking meat up as it cooks, season ground beef with salt, pepper, garlic powder and onion powder. Cook until meat no longer pink. Drain grease. Add tomato sauce, stir well. Once pasta cooked, drain well and return pasta to pot. Add butter, stir until butter melted. Add melt cheese to pasta, stir well. Then add pasta to meat mixture, stir well. Sprinkle paprika. Enjoy! Delicious and hearty-great for a chilly winters night. Yum! It is great that we can put these hearty one dish meals back on the menu! Growing up, mac & cheese was one of my favoite foods.... and still one of my favorite foods. Love it. 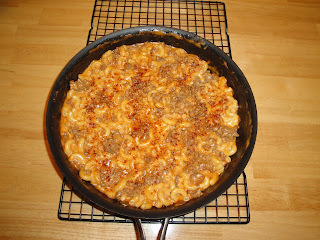 This is similar to a chili macaroni dish on my blog! Would you consider adding vegetables to make it a one stop meal? Yummo...funny I have a post up about mac and cheese too!! There's also a giveaway if you wanted to peek in! Ooops...just left the wrong link in my comment...here's the right on! No veggies in this dish... sorry. I will be happy to visit your blog. Thanks for stopping by. This looks perfect. I just had a "discussion" on a taco dip that would make a great taco beef mac and cheese. This is right up that alley. It looks delicious. This sounds like a much better version than hamburger helper, Christine! Yummy! It's super interesting to learn the history behind some of our favorite foods! This looks like the ultimate comfort food. Looks good Christine but since we don't eat beef, probably will try with lamb for a change. Love mac and cheese. Ultimate comfort food!! Since I started shopping at Aldi I have save $150.00 on my grocery bill. Mmmm... This looks so good Christine! Buzzed ya! Looks yummy. I buzzed you. Nice twist to an American classic. That's a meal the whole family would like. Yum!!! I love that it's a homemade version of an old hamburger helper dish. Or at least that is what I thought of when I saw it. :) My dad used to make that stuff for me as a kid obviously he can't cook. I will have to try your version I am sure it surpasses anything I ever had that came from a box. This is much better then what you can get in the box. I always enjoy your food facts and my nephew would love this mac and cheese. He's crazy for the stuff.